P1: The durkoos flew over the city, seeking to dislodge the dragon clinging to its neck. P2: John Carter and Dejah Thoris held desperately to its leg, powerless to control their fate. P3: They had flown over the city when the girl exclaimed: "Look, John Carter, down there upon the desert!" P4: Below, Sola, the faithful green woman, and Woola, the Earthman's calot, viewed helplessly their friend's plight. P5: "There must be a way, Dejah Thoris!" Carter declared. Suddenly his own words suggested a daring plan. P6: Drawing his longsword, he began slicing away the bird's wing feathers. He thought of the deadly fall if his plan failed. P7: But slowly they lost altitude. Finally the man and girl dropped safely to the ground and the fighting monsters rose again. P8: The joy of their reunion was short-lived, for the princess' body, affected by the vapors in the city had suddenly turned rigid and stony! 1. By the wildest chance, the giant bird carries Carter and the princess over their campsite of the previous night and the couple spot Sola and Woola below. This coincidence needs a better explanation in the novelization. Carter might sense Woola's telepathic thoughts, glance downward and spot the calot. Then Dejah Thoris could follow his gaze and pick out the distant figuire of Sola. In the novelization the couple should be dropped down at a considerable distance from Sola, and Carter should agonize over Dejah Thoris' continuing calcification -- doing all he can to prevent her deterioration (shading her from the sunshine with his cape and transferring yellow oil from his skin to hers). But, by the time the running Woola arrives, the princess is "rigid and stony." CHAPTER 20: "A DIZZY FLIGHT!" For two hours Sola and the calot made their way across the barren wastes of the no-man's-land which borders the dominions of the Tharkian hordes on the east. She now had a fair idea where she was -- thousands of haads south of the dead city of Korad and practically due east of Thark. It was a region she had visited several times during her brief childhood and now the green girl was certain she could pick out a route north, past the green race's encampments and then west to the waterways of Helium. If only John Carter and Dejah Thoris yet lived! The three pinnacles rose up before her and far beyond them, the line of high land on the distant horizon that betokened the forbidden Plateau of Eo. Woola was already halfway to the pinnacles and when she reached that same spot, Sola knew she would gaze upon fabled Go-La-Ra, the city of the deadly mists. However, her scrutinizing of the northern horizon was interrupted by an extraordinary sight, high in the sky, just short of the three pointed rocks. The durkoos flew high over the city, seeking to dislodge the dragon clinging to its neck. 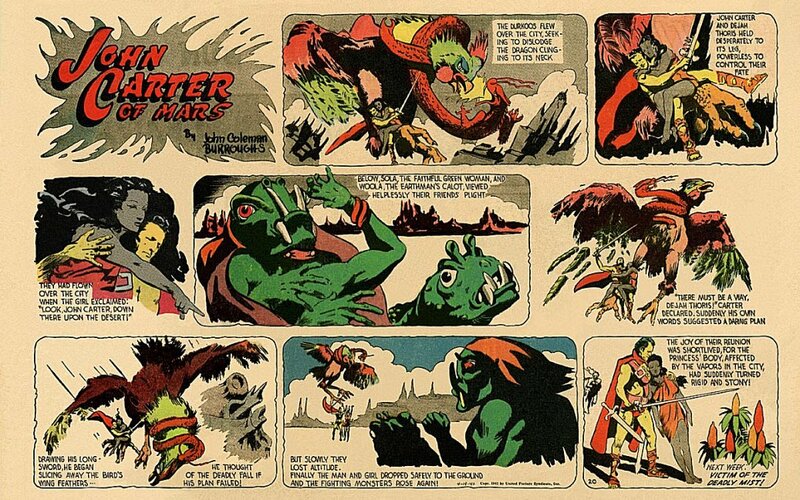 John Carter clung desperately to the great bird's leg with one hand, while in the other arm he held the Martian princess. The two monsters continued their aerial battle, but it was plainly clear that the bird was tiring. Its wings beat with a labored flapping that brought it closer and closer to the ground with each passing second. Sooner or later the fatigued durkoos would have to alight. The only question in John Carter's thoughts was whether or not he could hold on long enough to witness that conclusion. His fingers were growing stiff and cold -- and, like the ashen body of the girl he held to his breast, they too were changing to a dismal gray. With all his strength the Earthman pulled himself upward, until he managed to throw one leg over the giant bird's foot spur. It was a precarious seat, but by holding on with his legs he could free one hand long enough to carry out the mad plan that was developing in his brain. Her voice was so raspy and unnatural that he could scarcely fathom what the two syllables were that Dejah Thoris had spoken. But her thoughts played upon his and he knew he should look downward, to the Marscape below. He saw the outer bounds of Go-La-Ra, the three pinnacles and a wild thoat upon the mossy flatlands. Then John Carter looked more carefully and he recognized the mount and its rider. The green girl waved her sword in circles high above her head. She projected her thoughts with all her might, upward at the strange scene above her. But if her friends saw her they gave no indication of it. A few scattered images of the giant bird and its unwanted passengers played across her mind, but those came from steadfast Woola, not from the minds of the two humans. Sola looked at the empty rifle boot beside her in anguish. If only they had fled Thark with a radium rifle, she might use the weapon to some good effect now. But their lone rifle had been lost with the runaway thoat at the courtyard of Tal Hajus and the Jasoomian's pistol had been taken by her father. So Sola, the faithful green friend of John Carter and Dejah Thoris, and Woola, the Earthman's loyal calot, could only look on helplessly as events unfolded which were beyond their power to influence in the slightest. "I think there may be a way, Dejah Thoris!" Carter shouted; but no reply came from the maiden. There was nothing he could do but attempt the daring plan that had formed in his head. Drawing his long-sword, he began slicing away at the bird's flight feathers, each time the flapping left wing came within reach. The durkoos had been losing altitude since it left the city and now it flew erratically -- first one way then another. Finally the feathered monster dipped far downward. John Carter's legs released their hold and both man and girl dropped to the ground. Relieved of the heavy burden, the fighting monsters rose again. However the wing of the durkoos was so badly damaged that it could not stay aloft for long. Both bird and dragon plunged into the long abandoned quays of Go-La-Ra and perished in one of the smoking craters that poured out the deadly purple vapors. The couple had landed a few hundred paces from the base of the pinnacles and John Carter recalled the cistern of yellow protective oil. If he could just drag the rigid body of Dejah Thoris that far, perhaps there was yet hope. Along the way he was overtaken by an overjoyed Woola, but the Earthman could only offer a few words of welcome. He strained to carry his princess the remaining distance. His happy reunion with the green girl was short-lived, for the princess' body, affected by the vapors of the city, had suddenly turned totally rigid and stony. Sola dismounted and helped him carry the frozen princess the short distance to the cistern. They lay the lifeless form out upon her back and applied the singular oil all over her body, but to no avail. She remained a statue, though her two friends watched and waited for an hour or more. John Carter insisted that they remove themselves as far away as possible from the dead city and its accursed mists, so it was late in the night before he and Sola stopped at a suitable spot on the sea bottom to make their camp. Both of them were overcome with grief at the girl's undeserved fate, but neither the Thark nor the Earthman could find the words to express that common sorrow. They kept a silent vigil over the body, until the exhausted and afflicted man at last fell asleep. The daughter of Tars Tarkas and Gozava remained awake all night, grieving over the loss of her one dear female friend on all of warlike Barsoom. She had brought a flask of the yellow oil with her and half of this she added to that coating already covering the girl's body, but no good came of it. By a slip of her hand she knocked into the rigid hair of Dejah Thoris and a curl fell away from her head as though it were broken glass. Then Sola too cried. While John Carter slept the green girl applied the remaining oil to his naked body, cleaning his several bad cuts and scratches in the process. His right arm was stony almost to the elbow, but on the man's left side only three of the fingers had turned gray and they were not entirely unbending. The Thark continued to massage the afflicted fingers, rubbing in the lemon hued oil until it had well penetrated the skin. Then she and the calot kept each other company until daybreak. Sola prepared what little food was left in the saddle bags and waited for the Earthman to awaken. She then inspected the sleeping man's calcified fingers. They were no better, but at least they were no worse. Then she knew not what else to do, but eventually most satisfactory idea came to her. "Why, of course!" she said aloud. "The Plateau of Eo is but three days' walk from here. There we may yet find a remedy for this terrible malady!